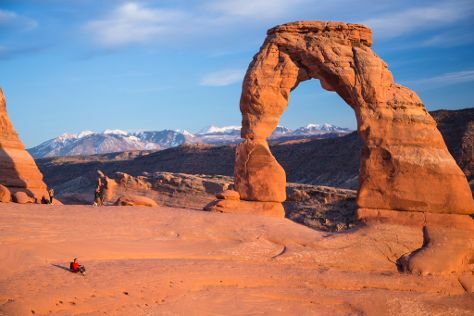 A huge but sparsely populated land, Utah remains a major holiday destination offering plenty of year-round outdoor vacation ideas, including skiing, snowboarding, hiking, boating, horseback riding, and camping. The rugged terrain, defined by towering mountain peaks, deep canyons, and vast deserts, seems custom-made for adventurous nature lovers. With five national parks, the state has no shortage of pristine wilderness areas, causing many tourists to overlook the cultural attractions of its towns. Salt Lake City, the state's capital, features the headquarters of the Mormon Church, and draws over 5 million annual visitors. Utah also hosts several major film festivals each year, attracting young movie buffs from around the world. Utah is in United States. Use our online itinerary creator: Utah and all its delights await.